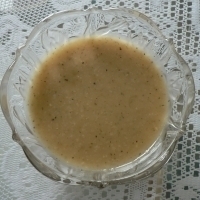 This delicious, sweet and tangy homemade vinaigrette is achieved by mixing olive oil, pure maple syrup, dijon, apple-cider vinegar, herbs and orange zest. Tastes much better than commercial salad dressings. Combine all the ingredients in a food processor and process thoroughly for 2 to 3 minutes until well mixed. Shake before drizzling on your favourite garden salad. NOTES: Recipe may be doubled and can be kept refrigerated for up to 2 weeks. Shake before using. Lemon zest may be substituted for the orange zest for a more tangy vinaigrette. I've never had, or even heard of, a maple syrup vinaigrette. Want to try this for sure! Adding to the try soon folder in my recipe box.